Seen alot of reports of the Panther D burning out due to engine problems and ammo & gas storage issues when hit on the side. Considering how the turrent and chassis were reworked for the A and G models (turrent on A, chassis on G; and G used the newer A turrent), did the Panther get better survivability later in the war? the engine problems seemed to have been worked out by the end of 1943 or so; but I can't find any reports of the panther burning out easily due to side hits late war. Absence of evidence is not evidence of absence however... it could be that it was just an accepted problem, and not note worthy in 1944/5. As I recall, it was a problem with leaking gas lines, which was solved rather quickly when discovered. Don't have the Panther book handy, but Jentz has a combat report for one of the panzer divisions which mentions the D had ammo and gas tank exploding problems when hit from the side. I want to say August/October 1943. And the mechnical reports do indicate the leaky gas tank and fluid issues experienced at Kursk were fixed by fall 1943. But what abou the ammo/gas tank placement issues? Epaminondas wrote: the engine problems seemed to have been worked out by the end of 1943 or so; but I can't find any reports of the panther burning out easily due to side hits late war. Absence of evidence is not evidence of absence however... it could be that it was just an accepted problem, and not note worthy in 1944/5. The problem was never actually corrected, it was more or less swept under the rug and of course was also masked by the Panthers strengths. Allied technical and tactical bulletins pinpointed the vulnerability of the sponson racks and emphasized them as a prime target area through the end of the war. Watch the flick of the Cologne Panthers destruction to see what happens when a Panther takes a round in the side ammo racks, the results are exactly the same as for an early M-4 in the same situation and for T-34 for that matter - flash initial propellent fire (depending upon the number of rounds compromised by the hit), followed by a steady lower intensity burn caused by flamable interior fittings, punctuated by random cookoffs as the heat compromised additional undamaged rounds. Note also the crew reaction, who were obviously well aware of the potential threat caused by such a penetration - get out as soon as possible rather than try to fight back. Epaminondas wrote: Don't have the Panther book handy, but Jentz has a combat report for one of the panzer divisions which mentions the D had ammo and gas tank exploding problems when hit from the side. I want to say August/October 1943. I have a copy of this book. Based on your comments in this thread, it is obvious that you did not read it very carefully. Also when the fuel tanks were not filled completely they burned more easy becaue of the air/fuel gas vapours inside the fuel tanks. I admit I read it quickly, but the book seemed to have quite a bit of info of the ammo/gas burning from a side hit in 1943; but nothing about if the A/G models fixed the problem. Lots of info here but I can confidently tell you about the flammability of Panthers. Want to see the Jagd? Absolutely beautiful! I would wish to ride on it!!! 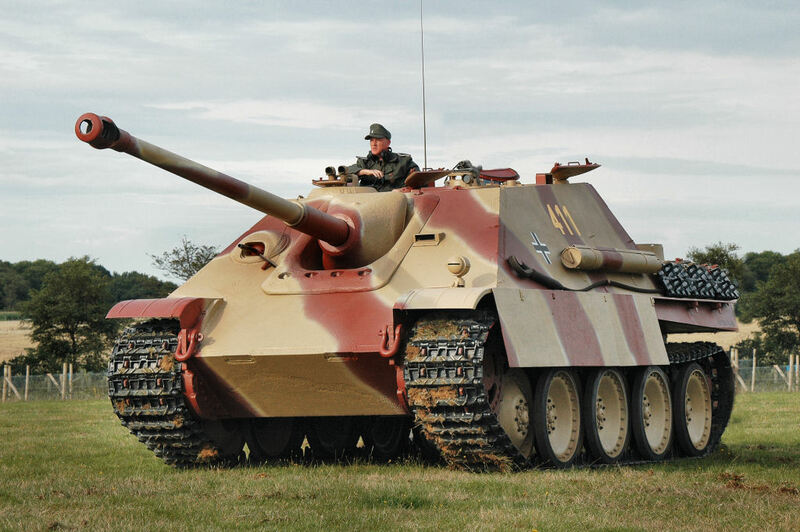 That Jagdpanther looks very impressive, it would be great to see both the Panther,and the Jagdpanther in one shot, once work has been finished on the Panther. Superb photograph and excellent excellent restoration work. Do you have any more information or pictures about the restoration project itself? weebobster wrote: Superb photograph and excellent excellent restoration work. Do you have any more information or pictures about the restoration project itself? What was the camo based on? The orginal paint scheme of one of the two Jagdpanthers? Do you know what units the two Jagdpanthers belonged to? 1 The probablility is that both tanks WILL in fact appear together and if very lucky me and/or my boys will be on them! 2 Thanks Tanker Mike - that is indeed the Foundation's website where their other vehicles can be seen. We only two weeks ago supplied them with a fabulous StK40 in a Sauerkopf which will speed their StuG project up considerably. 3 I have ridden on/in it and it is unbelieveable - The eingine is so...thoroughbred... quiet for such a huge machine! 4 The colour scheme on this Jagd is as per the original. The lines on the edging are where the painters sprayed guidlines in order to get the camo balanced.... Sort of like when you draw a pencil line on a model before spraying it. This is according to the restorer's research an accurate procedure and paint finish. The Jagd is actually a machine from the 116 Panzer Division Der Windhund and the Panther under restoration needs more research but is at present believed to belong to Das Reich. More work needed before absolute certainty can be assured. Mike - if you are in England and a serious student - Contact the Foundation and arrange a visit. They have strict conditions (Naturally) but you may be pleasantly surprised.